This is from Pop Weekly's July 31, 1965 issue. 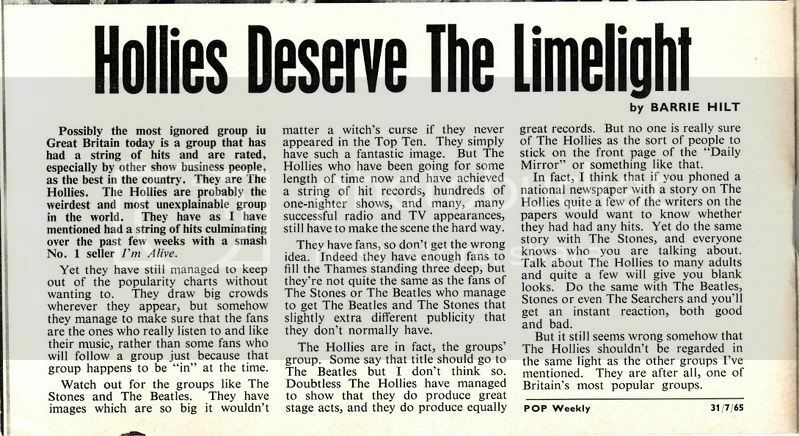 The article was about the Hollies not getting enough of the limelight. Read it and see if you agree. I wanted to post the photo and text separately, so they would come out larger, but when I cropped the photo into a separate document, it had this ciruclar texture about it that it didn't have in the original scan, so I decided to keep the text and photo together in order to maintain the better quality in the photo. I suppose it's been said in one way or another, the reason the Hollies fell short of the limelight was because of their clean cut appearance and that they never destroyed hotel rooms while on tour. To them it was all about the music, for which I am eternally grateful. As always Vrinda, great article and photo...thanks! I remember Jimmy Savile always used to refer to the Hollies all through the sixties as the group's group. Thanks, John and Alan. I wish more groups today would follow the Hollies' example! Here's the photo. I managed to crop and resize it so the strange texture doesn't show. Yes, I totally agree to what the article says. I always understood why The Beatles were the most popular group. In three words: They were trendsetters, so they deserved their fame. But to be honest, I never understood the enormous fame of The Stones. They were followers in the footsteps of The Beatles just like every other Beat group with a lot of differences in relation to The Hollies. 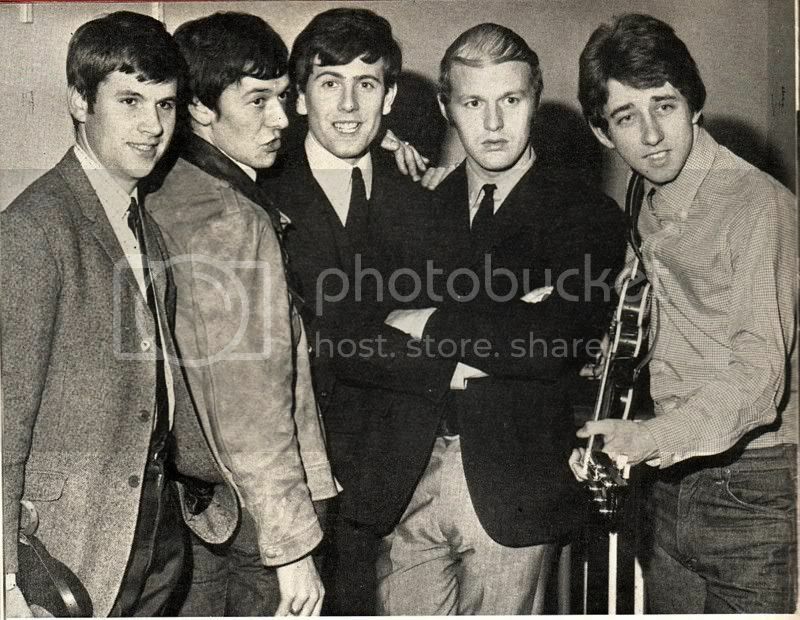 The Hollies had the much better singer (Mick Jagger could sing rock but he would have failed singing "He Ain't Heavy" while Allan could sing both perfectly), the better lead guitarist, the better drummer (Bobby is better than Ringo and Charlie together) and the best harmony vocals ever. Just from a musical point of view The Beatles and The Hollies should be the two bands in the spotlight when there is talk about the 1960s and not The Beatles and The Stones. I couldn't agree more, Benny! However, you say that to any Stones fans and they'll beat you to within an inch of your life. I never understood the Stones' appeal, but because I have friends who are fans of the Stones, I don't express my opinions about them out loud when I'm around them. I think the Stones got a lot of attention because of their raunchiness and bad boy image. They wanted to come across as more macho than the Beatles and the other British groups. That was their trademark and they played it for all they could. 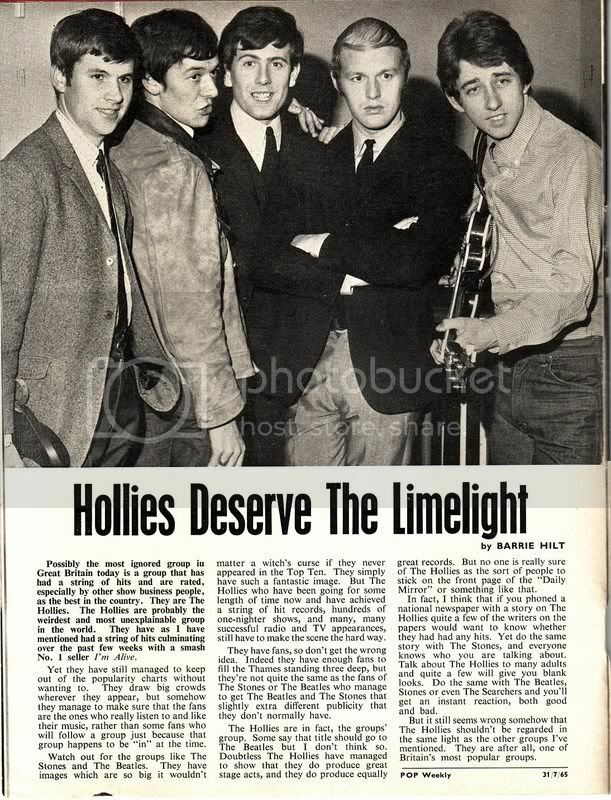 The Hollies had no trademark other than their quality singing, musicanship, clean-cut, fresh look, and likeable personalites - something many bands then as well as now needed and need to have. The Hollies songs were immaculately produced. I might get some flack for this but George Martin's production of Beatles songs doesn't sound as good to me as Ron Richards for The Hollies. Stones records were really rough and ready and I find the drums aren't recorded very well. I read that comment in a book once, James, but don't believe every word of it. It was put out by a person who said they were a Beatles publicist, and it might have been fabricated to to create some contorversy and give both bands unwanted attention. I don't see a great difference between George Martin's production of the Beatles' music and Ron Richards's production of the Hollies's music. I don't knoow enough to make any distinction, but the two had different sounds and did different songs each, so for what each group was doing, I think both producers did an outstanding job with their respective charges. Is there even a distinguishable difference between session musicians and live groups?